Nothing is more satisfying than a nice cup of coffee on a cold winter morning right? To ensure you get the best experience from your coffee, we have been studiously trying and testing a whole range of coffee makers. Today, we are going to tell you more about the Mr. Coffee Optimal Brew machine. This machine is at the slightly lower end of the mid range pricing and retails at around $70. It’s not cheap, but it does not break the bank expensive either. It’s still enough of a price that no one wants to purchase one and then realise it probably isn’t the machine for them. We have collated out information to make sure that doesn’t happen to you. Removable water reservoir: This makes filling the water tank and emptying out any excess, left over water easy. It also makes cleaning easy too. Just brewed thermal carafe technology: The thermal carafe with the just brewed technology works to lock in heat while maintaining the fresh taste you want your coffee to have. Water filtration ready: Simply add a filter to remove the pesky chemicals from your water leading to better tasting coffee and less need to descale your machine. Daily brew timer: Set the timer so your coffee will start brewing at a pre-selected time meaning you can wake up to a freshly brewed pot of coffee every day. Freshness timer: This features ensures the coffee you are drinking is still fresh. If it moves out of the time for freshness, the machine will alert you. Auto shut off: The machine will automatically switch off after two hours so you no longer need to keep the notion of turning it off in your mind. Saves you power and money. Grab a Cup auto pause: This feature allows you to pause the brew mid cycle and grab a cheeky cup before the brewing process has finished. Ideal if you’re in a hurry and want to grab a cup of coffee earlier than you’d planned. Cleaning cycle feature: The machine will tell you when it needs to be cleaned so you don’t need to try and remember when its due. Lift and Clean filter basket: Cleaning your machine has never been easier than the new lift and clean feature allows. Simply lift the filter basket and clean! Optimal brew time: The machine brews a ten cup carafe in seven minutes – The perfect time for full extraction without over extracting. Mr Coffee GTF2-1 Basket Style Gold Tone Permanent Filter – This means you won’t have to buy anymore paper filters which can save you a lot of money in the long run. The Mr Coffee Optimal Brew machine is simple to work. Simply fill up the water reservoir, add your coffee and go. The pre-set timer is also easy to use. Just fill up the water and coffee and select the time you want to brew your coffee and switch the machine on. This machine is ideal for anyone who wants a practical, easy to use machine that can be pre-programmed and doesn’t require much maintenance or hassle to get good tasting coffee daily. This machine isn’t ideal for anyone who likes their coffee to really pack a punch. You can add extra coffee to get the flavour a bit stronger, but it never reaches that really dense strength that comes from coffee that’s almost syrupy in texture. 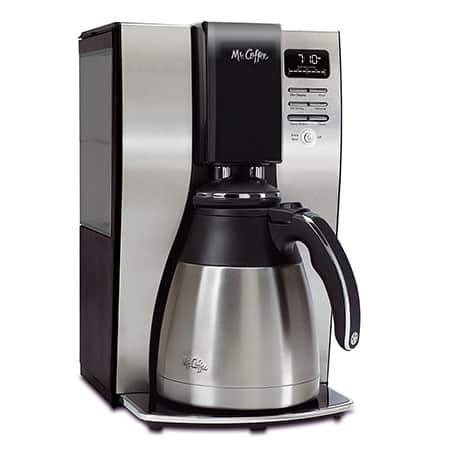 Overall, the Mr Coffee Optimal Brew machine is consistent with the level of features and use you would expect from a machine from this brand. As long as you don’t like your coffee overly strong it produces a consistently good tasting coffee time after time. Today, we are going to tell you more about the Mr. Coffee Optimal Brew machine. This machine is at the slightly lower end of the mid-range pricing and retails at around $70. It’s not cheap, but it does not break the bank expensive either.